There are leaders who carry the masses with them and there are leaders who carry forward the nations with them. Mahatma Gandhi was tallest among those who could mesmerize the masses belonging to any group or class spontaneously and effortlessly. Only few have made the masses to march to their tune in such adverse circumstances as existed in India. Thus Gandhi Ji was able to create a storm which uprooted the well-entrenched feet of the British and make this nation throw their yoke. 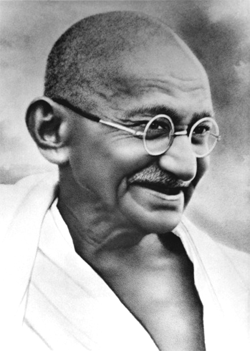 Subsequently, this experiment of Gandhi was replicated by the likes of Mandela, Martin Luther King, and many others. However, Mahatma Gandhi’s qualities to nurture and carry forward the nation need a close scrutiny. In fact, during his last days, despite immense reverence for him in everybody’s heart, even some of his closest followers had started putting a question mark on his views on governance. Due to his unfortunate death soon after attainment of independence, Mahatma Gandhi’s views on governance of the country were never put to test. Though the framers of the Constitution and some early rulers of the country took guidance from Mahatma’s views, the Mahatma was often forgotten or ignored in practice, if not in principle. This doctrine of exclusion might have made some sense when it was written, but today in the age of globalization only a retrogressive nation would embark upon such path. This will lead to deprivation of our citizens from the vast knowledge and creature comforts that the modernity has produced and is producing day-by-day. It took only 15 years after Gandhi for the Chinese to prove that Ahimsa is not a workable concept in international affairs and may lead to self-invited subjugation by the powerful. Gandhi suggested that mechanization was an evil when there are more hands than required for the work, as is the case in India. Today, it has been proved beyond doubt that such a concept is totally outdated and can lead only to economic stagnation. He was also of the view that race for the moon is madness, but subsequent developments have shown that space research is not only an expansion of human knowledge beyond our planet but may also turn out to be a source of vast amounts of energy and precious minerals as well as a safe haven for humanity battered by cosmic and alien forces in future. But this critique of Gandhi’s socio-political dynamics does not mean that he had completely blurred vision of India’s future, or that he had not contributed great ideas for building a just, humane, and forward looking nation. Gandhi was an spiritual idealist. Since he did not differentiate between preaching and practice, he insisted on applying his idealistic views not only in social transformation, but also in national and international politics. Here some of views turned out to be non-pragmatic. His views on family, children, women, oppressed classes, language, communal harmony and democratic values have nurtured our families to become more humane and happier units, our society to become more just and equitable and our nation to become a strong and vibrant democracy. Most of them are of universal application and will keep on guiding the man and his surroundings forever. Well said; both pro and con. Time changes the context of everything. We have to remember the essence of what Gandhiji said and apply that in a pragmatic way to solve today's problems. While globalization is essential for economic growth it should not be by sacrificing indigenous growth. We need both, the organic and the inorganic growth. Swaraj in today's context is where the governance is driven down the system where the people should have a structured input in what is being planned and spent for them. The common man and the un-empowered should not be left behind in the rush for globalized fast track growth. We can take lessons from Gandhiji's life and thoughts on all these issues. We often run into the two extremes of people; one, who think Gandhiji was a liability for the nation and the other who want to follow rigidly what he said some 70 years ago. A more thoughtful approach such as what is expressed in this article is needed.